Timber, bark, mud, clay, stone, Galvanized iron. A slab hut is a kind of dwelling or shed made from slabs of split or sawn timber. It was a common form of construction used by settlers in Australia and New Zealand during their nations' Colonial periods. New Zealand's European settlers also had to adapt to local circumstances, building with whatever materials were available, and employing tools of poor quality, or even none at all. Settlers tended to use the Maori word whare (house), instead of 'hut', for a temporary or pioneer dwelling. "Ten pounds will go a long way towards putting up a sod hut; a cabin of outside slabs and refuse timber from the sawmills, or a serviceable tent with timber frame and sod chimney, sufficient to protect the inmates from the weather, and afford a temporary home at all events. There is, too, one great advantage [to] the immigrants hampering themselves at first with only slender households, for they may very soon find it to their interest to change their place of abode, in order to secure higher wages or engage in more congenial occupations..."
The usual slab hut was built entirely from timber and bark. Australian settlers found that the most fissile timbers were the Eucalypts: blackbutt, bluegum, stringybark, ironbark and turpentine. Some of these species are also termite resistant. The chimney, too, was often made of wood, although sometimes sods were used. The fireplace may have been given a lining of stones, sometimes covered with a plaster of mud or clay. Settlers used a thatch of raupo, toitoi, flax, fern, or totara bark; they erected tents from poles, saplings, canvas, and planks or split slabs; and made tree-fern huts or more permanent dwellings from clay, sods, wattle and daub, or stone. A slab hut is actually a 'slab-walled' structure. Its walls were, strictly speaking, built from 'flitches'. Slabs are sawn from a trunk, flitches are split from it.[n. 6] Hut-builders felled selected trees,[n. 7] and sawed the trunks into suitable lengths.[n. 8] They then split these lengths into flitches using a maul and a wedge.[n. 9] Timber was split tangentially, that is, along the grain, instead of by the traditional British radial method, from the core of the trunk out towards the bark. There was neither time nor tools suitable to properly dress timber into planks, nor to season the timber; it was used green. Rafters would be fixed atop the slab walls, and a pitched roof erected. The dimensions of the hut would be kept small, to avoid the need for roof trusses. Joists were not always laid, and a ceiling was not always included. A Queensland example can be seen here. If a ceiling was added, it was chiefly used for storage. Slab dwellings with a second storey were almost unknown. A bark roof was common, and was quickly and easily erected. living trees in sheets of about six feet long and from two to four feet wide, laid upon rafters composed of small sapling poles just as they came from being cut in the bush. The sheets of bark, having holes pierced through each in pairs, were then tied on the rafters with cords twisted of the inner rind of the kurrajong tree. The whole framing of the roof was secured as it was needed by wooden pins in order to save the expense of nails, which were then both too scarce and too dear to be used by the lower order of settlers. corresponding parts of the frames. Whether or not a slab hut was lined, inside or out, depended on the economic means, the energy and skill, and the taste of the occupants. Beyond the need for simple weatherproofing lay the desire for some aesthetic satisfaction, the wish to make one's dwelling place pleasing in appearance as well as comfortable to occupy. Battens might be nailed over the gaps between slabs, or the entire exterior might be clad with weatherboards. The exterior might then be painted, using mixes of materials as diverse as skim milk, quick-lime, lampblack and cement or plastered over entirely. All these measures were less to do with appearance than with preservation of the fabric of the building. Floors might consist of the original ground upon which the hut was erected, but various mixtures of sand, clay, cow-dung, and similar materials were laid to make a firmer, more level, or harder-wearing indoor surface. Termite mounds, crushed and watered, had many of the properties of poured concrete when used as flooring material. Termites mix their saliva, faeces and other substances to bind soil particles and form their mound: this type of flooring was known as 'ant bed'. All of these substances or mixes required regular maintenance, either by watering them to re-solidify the materials, or by spreading a new layer of mixture on top. Timber slabs might also be laid directly on the earth to form a floor. More sophisticated and permanent dwellings had properly sawn floorboards nailed onto bearers. The basic slab hut derived its plan from the vernacular English crofter's hut, a simple rectangular walled shelter with one door, and perhaps holes to allow air to enter. The interior spaces might later be partitioned off. To this design Australian settlers often added a verandah. Most slab-hut construction techniques could be described as bush carpentry. Few early settlers could afford the time, or possessed the capital, to build any dwelling more impressive than a slab hut: they had first to clear their land and get a crop planted or pasture fenced. In later years, according to the terms of their purchase, selectors had to erect and occupy a dwelling on their land as soon as possible.[n. 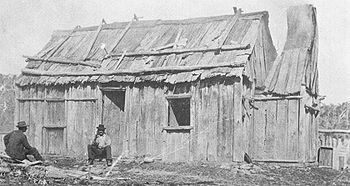 11] On the goldfields, or timber-getting, only a temporary dwelling, produced quickly from available materials, was thought necessary. Since a majority of early settlers had formerly been manual labourers, they brought with them a sound practical ability and aptitude for 'making do'; other settlers observed or helped those more skilled and copied their techniques. The average settler could thus erect a basic hut in two or three weeks, adding to or modifying it later. The two preferred methods of slab hut construction differed chiefly in the placement of the wall slabs: vertically or horizontally. which constituted the hearth and baking-place. If only a top plate was used, the top of each slab was pushed up into the groove (a mortise). The bottom of the slab was merely set into a trench. When a wall bottom plate was used, it was also mortised.[n. 12] Each slab was slid in at one end of these plates; on the bottom plate, an extra piece was cut out at one end of the groove to widen it and allow each slab to be fitted in: this piece was replaced after the last slab was inserted. Another method was to make a much deeper mortise in the top plate. In this case, each slab was lifted up into the deep top groove and then dropped into the bottom one. A third method was to nail planks either side of the wall plates to form a channel to hold the slabs, instead of mortising. This was a much quicker method of construction, but it required the use of sawn and dressed timber, and nails. Slabs were sometimes chamfered at one or both ends to fit into the mortises. Each method took more time and labour, and used more material, but produced a progressively more sophisticated and permanent structure. The walls are erected by what is known as the drop-slab-panel system - upright panels formed of three-foot slabs cut from the outside slice of tree-trunks, and dropped horizontally, one above the other, between grooved posts - a simple arrangement, quickly run up and artistic in appearance - outside, a horizontally fluted surface, formed by the natural curves of the timber, and inside, flat, smooth walls.[n. 13] As in every third panel there was a door or a window, and as the horizontal slabs stopped within two feet of the ceiling, the building was exceedingly airy, and open on all sides. In this case, too, instead of grooving the posts, a channel might be made by nailing battens either side of the uprights, and the slabs fitted inside these. It is not clear which of these two methods was the more popular.[n. 14] Examples of each remain. The shearing shed shown in this illustration c. 1890 has walls of both vertical and horizontal slabs; the latter may have been a later addition. The horizontal method had the advantage that shorter slabs (known as 'billets') of timber could be used, but more uprights had to be erected and mortised to hold these. Slab-built farm buildings set the scene. The slab hut is mentioned often in classic Australian literature. Miles Franklin's Sybylla Melvyn grew up in a 'comfortable, wide-veranda'ed, irregularly built slab house' in the Timlinbilly Ranges and she was educated at 'Stringybark Hill Public... a little slab school house.' Richard Mahony hurriedly renovates his goldfields house and general store, so it will be fit for his new wife to occupy 'That her ears should not be polluted by the worst language of the customers he ran up a partition... cutting off the slab-walled portion of the house, with its roof of stringy-bark, from the log and canvas front. He also stopped with putty the worst gaps between the slabs...' Geoffrey Hamlyn recollects 'the old slab hut' at Baroona 'now quite overwhelmed' by the new, long, low house, the result of 'dull, stupid prosperity'. It was a slabbed house, with shingled roof, and space enough for two rooms, but the partition wasn't up. The floor was earth, but Dad had a mixture of sand and fresh cow-dung with which he used to keep it level. About once every month he would put it on, and everyone had to keep outside that day till it was dry. There were no locks on the doors. Pegs were put in to keep them fast at night, and the slabs were not very close together, for we could easily see anybody coming on horseback by looking through them. Joe and I used to play at counting the stars through the cracks in the roof. Mrs Aeneas Gunn writes of the satisfaction derived from building their slab homestead, 'beginning at the beginning of things': choosing, felling and sawing their own timber. In his A Fortunate Life, Bert Facey describes his method of building a slab house for a farmer, having watched and helped others to build such structures several times during his life. I've bought that big block of land ten miles north of here. Shall want you to go up and manage it. Take up Tom Hardy with you. He'll look after the cattle and cook. Then those two contractor fellows will soon run you up a slab hut. A tent will do till it's ready. A large clearing opened out on the right, and a little way back from the road-line stood a slab hut—or wharé, as it is generally called in New Zealand... A building of but one apartment... constructed entirely of split timber, but neatly put together. The roof was of iron, as was also the chimney. The latter, deep and wide, extended nearly across the whole of one end, and formed almost a small compartment of its own. Its dimensions, however, were but in keeping with the supply of firewood outside; and it is only in the bush districts that such fireplaces are to be seen... Two small windows gave light to the apartment. The deterioration of the hut depicted by Nicholas Chevalier in his Buffalo Ranges supports Louisa Meredith's observation about poor upkeep by many hut occupants. Unk White's 1960s sketches of Tyrrell's Vineyard in the Hunter Valley include a slab hut dating from 1858. The 'backblocks' humour of Australian cartoonists of the Smith's Weekly school such as Alex Gurney, Percy Leason, Stan Cross and Eric Jolliffe often included slab huts as a backdrop to their gags. Jolliffe also published detailed sketches of slab structures still standing, to preserve Australian heritage. 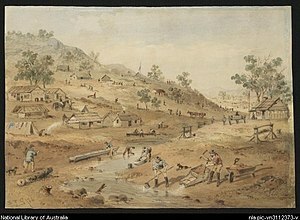 In journalism, illustrations of rural towns and farms in Australian newspapers and magazines of the Colonial era often show slab huts and homes. Examples can be seen in The Australasian Sketcher,[n. 17] The Sydney Mail and Sydney Punch. This slab-walled house (Fig. 1) was built in 1992, in the Watagan Ranges of New South Wales. It varies from the traditional design in several respects. It is raised off the ground on stumps (Fig. 5); the slab walls are of sawn timber, not flitches split from a trunk (Fig 2. ); it uses the nailed 'channel' method of holding the slabs, not mortises; the spaces between the slabs are filled with foam-rubber strips (Fig. 5); no attempt has been made to line or clad the house (Fig. 3); it has no chimney or fireplace as part of the structure; the floor is of chipboard. More akin to traditional structures, the roof has no joists, and there is no ceiling; the entire pitch of the roof forms the interior space, allowing for cooling in summer; the gable-ends are framed with studs and filled in with weatherboards (Fig. 4). The walls are kept square by a mezzanine floor, reached by an internal spiral staircase, making the house in effect a two-storey structure (Fig. 3). ^ See for example Thomas Watling A Direct North View of Sydney Cove, 1794 The trees are being rapidly cleared and burned. ^ Lewis, 5.02.1. Lewis also notes the local evolution of tools suited for Australian woodworking. ^ See Lucas, Australian Country Houses. Examples include Cressbrook, Gracemere, The Springs. ^ In a letter dated 1844, a settler wrote that the word 'hut' was the preferred local usage over 'cottage', for her slab dwelling. (see Starr, Pioneering New England) but another, writing in 1817 of his new slab home, noted 'My wife said that she didn't like me to call it a hut, so I made a memo, to call it a cottage.' (see Thornley The Adventures of an Immigrant p. 43). ^ Rawson, Australian Enquiry Book recommends trees ten inches in diameter as likely to be both sound, and easiest to handle. ^ This was to prevent 'dummying'. Wealthy squatters bought up multiple lots in the name of their agent or relatives (a 'dummy' owner), to discourage selectors by making good land hard to get. ^ Edwards, Australian Traditional Bush crafts p.19 observes that such a groove would fill with rainwater; a half-groove was preferred. ^ Lewis 2.04.11, disputes the generality of the term 'drop-slab-system' for horizontal slabbing, and suggests that it derives from Mrs Gunn herself. ^ Archer p. 68, claims the horizontal method was more favoured; Lewis, 2.04.11 suggests the opposite. ^ See The Australasian Sketcher Nov. 1878. 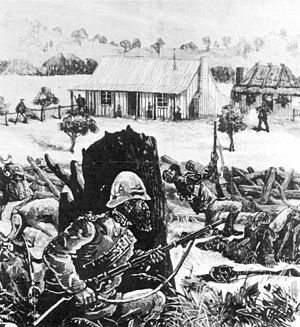 The slab hut depicted in this issue near Stringybark Creek was allegedly occupied by the Kelly Gang. ^ Freeland, p. 18; Herman, pp. 5-6; 10. ^ Cox, 1969. p. 51. ^ Timaru Herald, 26 August 1874. ^ Splitting Slabs for a Humpy, 1911. Oxley Library. ^ Cox, 1969. p. 59. ^ We Of the Never-Never, Chapter Thirteen. ^ A roughly built slabbed shearing shed. ^ My Brilliant Career Chapter 1 Archived 29 February 2012 at the Wayback Machine Project Gutenberg. ^ Richardson, Henry Handel. The Fortunes of Richard Mahony Chapter Nine. ^ Kingsley, Henry. The Recollections of Geoffry Hamlyn Chapter XXII Project Gutenberg. ^ Rudd, Our New Selection p. 3. ^ Meredith, Notes and Sketches Chapter VII. ^ The Letters of Rachel Henning 18 October 1862. ^ Facey, Bert. 1990. A Fortunate Life Solid Advice, p. 245. ^ Gleeson, J. 1976. Colonial Painters, 1788-1880 Lansdowne, Dee Why West. ISBN 0-7018-0731-8 The Buffalo Ranges, Victoria 1864. ^ Lindesay, V. 1980. The Inked-in Image: a social and historical survey of Australian Comic Art Hutchinson, Richmond. ISBN 0-09-135460-9. See 'Rural and Backblocks humour', p. 57. Adams, David. ed. 1986. The Letters of Rachel Henning. Angus and Robertson, Sydney. ISBN 0-207-14981-X See her letters of 18 October 1862; 10 August 1863. Baker, Sidney J. 1966. The Australian Language: an examination of the English language and English speech as used in Australia, from convict days to the present [...] Currawong, Sydney. Boyd, Robin. 1968. Australia's Home: its origins, builders and occupiers. Pelican, Melbourne. ISBN 0-522-84358-1 See "Materials and Methods"
Cousins, A. 1994. The Garden of New South Wales: a history of the Illawarra & Shoalhaven Districts 1770-1900. Illawarra Historical Society ISBN 0-909164-17-7 See "Settlement - Clearing Leases"
Freeland, J. M. 1974. Architecture in Australia. Pelican, 1974. See "The Primitives"
Herman, Morton. 1954. The Early Australian Architects and Their Work. Angus and Robertson, Sydney. See 'In the beginning'. Rollo D. Arnold: The Farthest Promised Land — English Villagers, New Zealand Immigrants of the 1870s. Chapter 13 "New Zealand — Arden"
Rudd, Steele. 1954. On Our Selection and Our New Selection. Angus and Robertson, Sydney. See "Starting the Selection"
"The Allan Slab Hut (entry 601934)". Queensland Heritage Register. Queensland Heritage Council. Retrieved 13 July 2015. Child's model, settler's hut, 1857. Powerhouse Museum, Sydney. Early Settlers Homes and Bush Huts in Australia. "The Springs Homestead and Outbuildings (listing RNE491)". Australia Heritage Places Inventory. Department of Sustainability, Environment, Water, Population and Communities.